There are several ways to buy Bitcoin now that the price is quickly approaching $10,000 per coin. localbitcoins.com is a website where you can meet up with local sellers of bitcoins. You will most likely pay more than the exchange price on Bitcoins. Pay cash, local, buyers and seller. Are you looking for a utility to copy your hard drive data to a new hard drive? Paragon Backup & Recovery 16 recommended by Windows Report reviewers as the No. 1 backup tool to use in 2018! If you are on the list for a Tesla Model 3, your wait could be anywhere from a few months, to possibly over a year. Tesla is now posting estimated delivery times for reservations. If you have a reservation, you login to your account and click on the Delivery Estimator. Some people have decided to sell their Model 3 reservation and make some money. For what was a $1000 reservation, some people are listing for $2500 or more. You can see on CraigsList some of the listings in the Los Angeles area. Tesla is also promoting the used Tesla Model S as an option for those who do not want to wait. 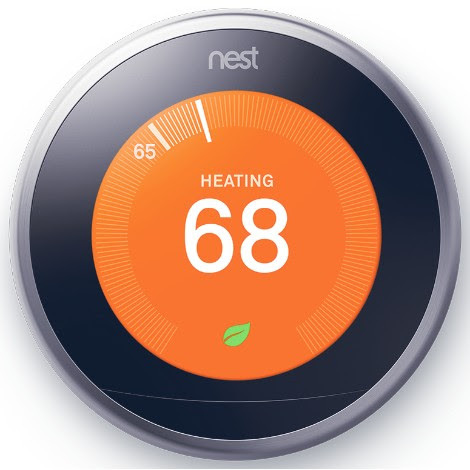 Smart thermostats are an easy way to lower your heating bill this winter. The WiFi-equipped thermostat learns your temperature preferences and automatically adjusts to keep you comfortable all day. To encourage our customers to “switch and save,” PWP is increasing the instant rebate from $40 to $90 on the industry’s most popular smart thermostat, dropping its price to just $159.99! The PWP WebShop Black Friday promotion is for a limited time, from November 22 to November 29. To learn more, click here. As we enter the Holiday Season, the Pasadena Police Department would like the public to be aware of an increase in purse and wallet thefts. These thefts have occurred primarily while unaware victims are dining at popular restaurants or coffee shops, shopping at the grocery store, or browsing at busy retailers. While it may seem convenient to leave your open purse in the shopping cart’s child seating area, or hung over your chair at the restaurant, this is when you are most vulnerable. The thieves involved in this criminal enterprise are very good as stealing without being detected and very fast! They are often standing right next to you, seated behind you, and he/she is often having one of their accomplices casually chatting with you as they swiftly reach into your purse and take your wallet. It is not until the victim reaches for his or her wallet that they realize it was stolen. and the thieves have already rung up hundreds of dollars in fraudulent purchases on your credit cards. Be aware that thieves will look like every other average shopper and have been both male (wallet-grabbers) and female (distractors). Past cases have indicated they are well or casually dressed in blazers, black women’s leather jackets and polo shirts; they like to wear sunglasses (even when indoors) and they are often talking on their cell phones while loitering suspiciously. They usually won’t have shopping bags or shopping carts so they can maneuver quickly and vacate the premise. WHAT: The Occasional Pasadena Doo Dah Parade celebrates 40 years of irreverent frolicking on the streets of Pasadena this Sunday, November 19th. On Doo Dah day, over 90 unique entries will be joining in the fun from all over Southern California. Dozens of inventive, if zany, art cars and floats will accompany a legion of revelers past the mom-n-pop shops along East Pasadena’s shady tree-lined streets with a memorable cast of eccentrics, disruptors, political pundits, lone wolves, and steam punks, comprising a legion of merrymakers. WHEN: Doo Dah steps off at 11am. Immediately following the event, many after-parties will take place in the Parade vicinity. The Parade loops along Colorado Boulevard, between Altadena Drive and San Gabriel Boulevard, in East Pasadena. COST: The event is always free-of-charge to the public! MORE INFO: This year’s lineup includes The Billionaires, Danse Macabre, The Eye, Bildge Rat, Flying Baby Homerun Border Crossing, The Aloha Oy Vey Ukelele Marching Band, Radioactive Chickenheads, Dr. Steele’s Army of Toy Soldiers, Unicorns with Palace, L.A. Derby Dolls, Kilt Brigade, Cyclops, Free Thought Society, Let’s Paint and March TV!, Saucer from Bakersfield, Partying Parrotheads, Murrugun the Mystic Sword Swallower, Trashion Show, Kid Swap, Pony Baloney Express, Fish Tank Dress, Black Sabbitch, Count Smokula, Lady DJ Sparkle Pony, Howdy Krishna, The Butler, The World’s Tallest Girl Scout, Recumbent Revolution, DubRobot, Doo Dah’s 2017 Queen Imani and Grand Marshal Marty Coleman, among many others. Secret Santa, Doo Dah’s take on the North Pole icon, will close the conga line and ring in the holiday season. And… not a rose will be harmed in the making of this parade! EVEN MORE INFO: Known as the twisted sister of the conventional Rose Parade, the Occasional Pasadena Doo Dah Parade began as a grassroots event in 1978 to gain national attention for its eccentric and, often, irreverent satire. The parade which has spawned numerous off-beat replicants across the country was even highlighted in last year’s Wall Street Journal. It was also named by Readers Digest as “America’s Best Parade,” and was recently featured in the book 50 Places You Must Visit Before You Die. PARKING: Plenty of easy street parking is available surrounding the area. Parade route is 1 mile west of the Sierra Madre Villa Gold Line Station. Take a city bus directly to the area. Call Uber or take a Metro bike! FOOD TRUCKS: (2636 E. Colorado Blvd.) Include Street Tamales, Rice Balls o’ Fire, Mr Softy’s Ice Cream and The Deli Doctor. They will be located next to Poo Bah Record Shop. 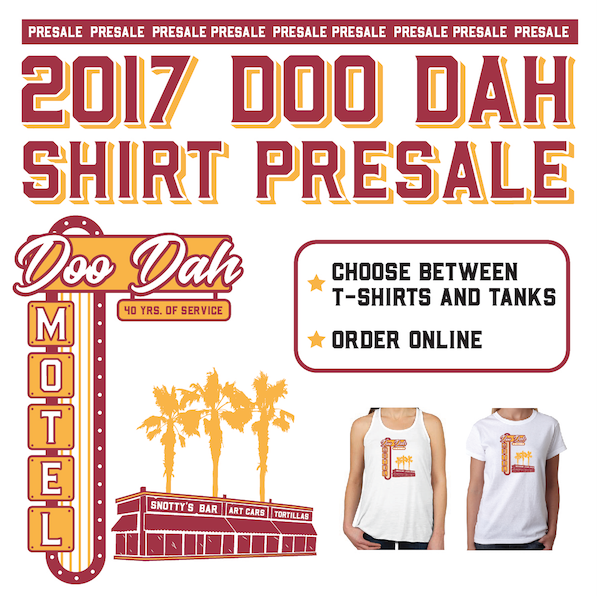 MERCHANDISE: Official 2017 Doo Dah T-Shirts will be for sale by vendors along the parade route, and vintage ones too! Support the Parade! OFFICIAL AFTER-PARTY: (179 N. Vinedo St.) American Legion Post 280, just 2 blocks north of Parade, immediately following the event. New Astroturf, more live bands, Doo Dah Royalty, dancing, cheap food and drinks!! $3 cover. PooBah Records, one of Pasadena’s favorite independent music stores, will feature live in-store DJ at 2636 E. Colorado Blvd., on the parade route. The famous Colorado Bar, located right next door at 2640 E. Colorado Blvd. will feature live bands, along with salty chips and drinks! Plate 38, hosts Queen Imani for lunch immediately following the parade at 2631 E. Colorado Blvd at Sierra Madre Blvd. This Saturday Nov 18th from 2-4pm. 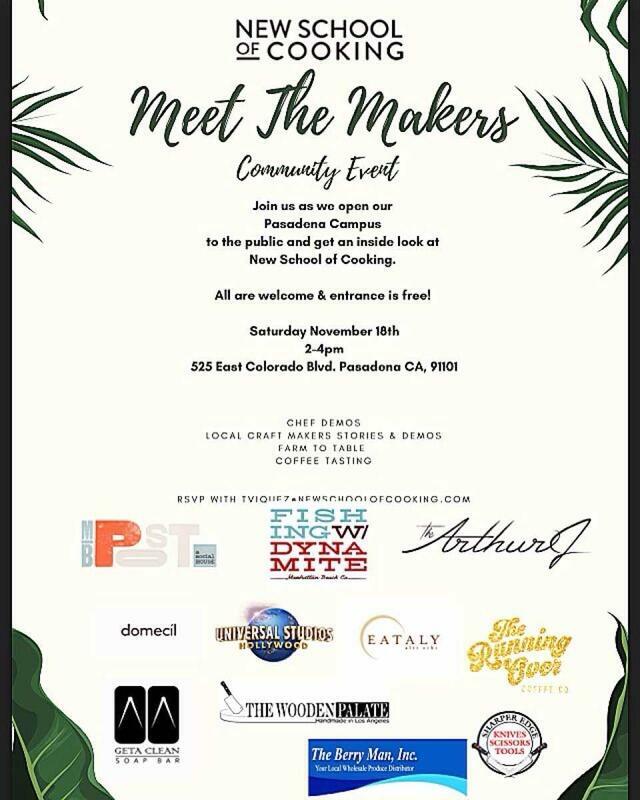 There will be Talks by makers, live butchering, oyster shucking, pastry demos, FREE eats and more! 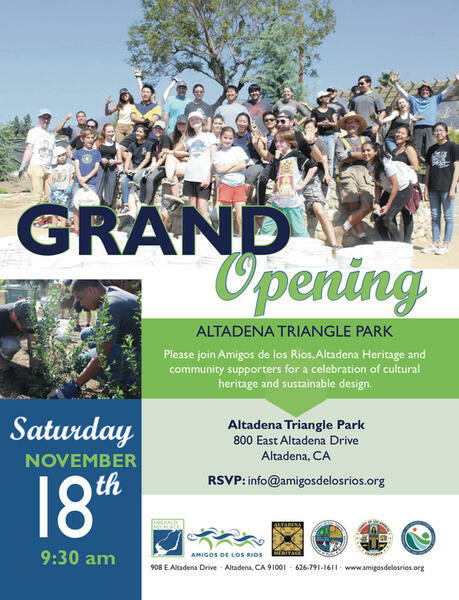 C’mon out to Altadena’s Triangle Park at the southwest corner of Lake and Altadena Aves. on Saturday, November 18 at 9:30 a.m. for the park’s grand reopening ceremony! Plenty of folks have created a bit of their own sweat equity in the park by coming out to help in recent weeks to help plant a *huge* number of native plants. Extra park benches and tables will be in place, and new interpretive signage will be in place as well. There’ll be a few surprises, and a great time should be had by all! See you there then! Come explore the Arroyo Seco and discover its rich natural and cultural history at One Arroyo Day! Find out about the One Arroyo vision, kids can earn a One Arroyo Nature Explorer Badge, and be part of a citywide celebration of all things Arroyo. Let us know you’re coming so we can buy enough hot dogs! * Bring a picnic! Enjoy hot dogs grilled by The Pasadena Firefighters Association, Local 809. First come, first serve! Confirmed Exhibitors & Participants: One Arroyo, Kidspace Children’s Museum, Tom Sawyer Camps , Rose Bowl Riders, MACH 1: Move a Child Higher, Oak Grove Disc Golf Course, The Pasadena Casting Club, Pasadena Roving Archers, Arroyo Seco Foundation, Arroyos & Foothills Conservancy, Pasadena Heritage, Pasadena Beautiful Foundation, Armory Center for the Arts, Dog Haus Running Club, Pasadena Pacers, Southwestern Herpetologists Society, Sierra Club – Pasadena Group, Pasadena Public Library, Pasadena Firefighters Local 809, and The Pasadena Community Emergency Response Team (CERT). Thank you to our sponsors: Western Asset Management, Wells Fargo Private Bank, AEG, City of Pasadena – Public Agency, Trader Joe’s – Pasadena , CA, Pasadena Firefighters Association Local 809, SodexoMAGIC, and dusitD2 Hotel Constance Pasadena! Please visit https://onearroyo.org/oad/ or email [email protected] for more information. Nope! All you need to do is RSVP here. Yes! We will have hot dogs, refreshments, and snacks, while supplies last. Is this event free and for all ages? Yes, this is a free and family friendly event. 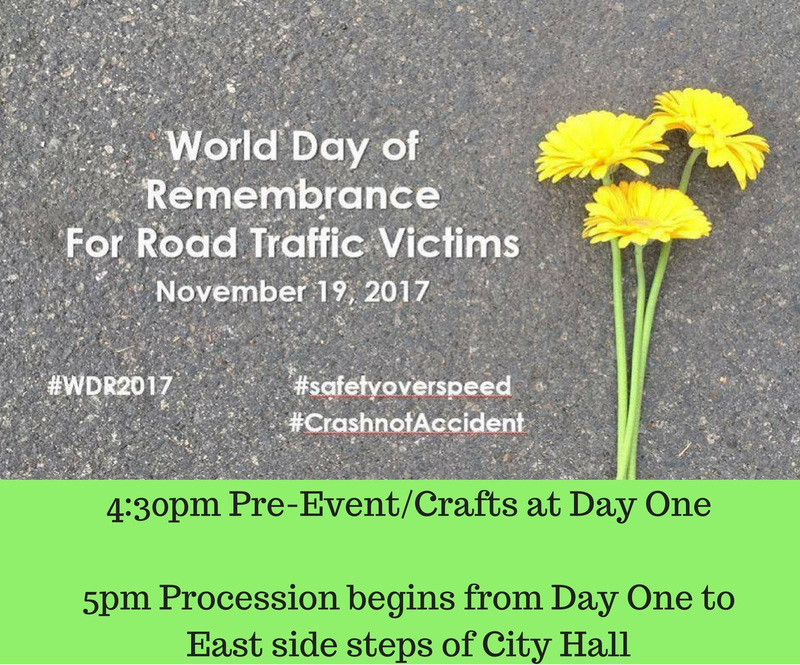 The World Day of Remembrance for Road Traffic Victims (WDR) is commemorated on the third Sunday of November each year- to remember the many millions killed and injured on the world’s roads, together with their families, friends and many others who are also affected. The special Remembrance Day is therefore intended to respond to the great need of road crash victims for public recognition of their loss and suffering. It has also become an important tool for governments and those who work to prevent crashes or respond to the aftermath since it offers the opportunity to demonstrate the enormous scale and impact of road deaths and injuries and the urgent need for action. SCAVENGER HUNT GAMESHEET – Coming Soon! 1:00pm: JESSICA CHILDRESS – LA-based singer/songwriter reminiscent of the golden age of classic soul, with an enormous voice that combines traditional R&B with a rock n’ roll energy. 2:30pm: JAMES SUPERCAVE – Psych pop artist featured on NPR and Vice. 4:00pm: WARBLY JETS – Power pop rock band from Los Angeles with dynamic live performances. Special guest appearances by Blair IB Singers and Lake Avenue Church Choristers and NewSong Choirs. View pics of South Lake’s 2016 Holiday Celebration! Follow South Lake on Facebook , Twitter, and Instagram! South Lake Avenue’s free Holidayfest! with live music, horse & carriage rides, kid’s craft, giveaways, holiday open house, scavenger hunt and more! FREE HOLIDAY FESTIVITIES – LIVE MUSIC – HORSE & CARRIAGE RIDES – SANTA – GIVEAWAYS- AND MORE! Guests are invited to enjoy the splendor of the holiday season during South Lake Avenue’s annual family friendly Holidayfest in Pasadena. This year the festive event takes place on Saturday, December 2nd at The Shops on Lake Avenue, 345 S. Lake Avenue. Presented by the South Lake Business Association, visitors are invited to celebrate the holidays by taking advantage of in-store specials and promotions at over 50 South Lake Pasadena merchants. Additional festive activities include horse & carriage rides, live music, photos with Santa, holiday characters, carolers, holiday crafts for kids, a themed scavenger hunt, giveaways and much more! This year’s musical guests include free live performances at Santa’s Village from some of the best local emerging talent. The music begins at 1pm with soul pop songstress Jessica Childress who is known for her enormous voice and dynamic live show combining traditional R&B with rock n’ roll. Popular psych pop artist James Supercave graces the stage at 2:30pm while Los Angeles’ own Warbly Jets round out the lineup with their infectious blend of rock ‘n’ roll and energetic pop. In addition, attendees can enjoy in-store sales and promotions offered at over 50 of South Lake Avenue’s restaurants, eateries and retailers listed below. Traditional carolers and holiday characters will roam the district creating a festive atmosphere not to be missed. Event goers can enjoy horse and carriage rides throughout the celebration, as well as participate in the popular scavenger hunt with an opportunity to win numerous prizes and giveaways valued at thousands of dollars. “Our holiday celebration definitely gets event attendees in the holiday spirit and invites everyone to explore the district while sharing memories with friends and family. Guests can tackle their holiday shopping lists by taking advantage of special in-store promotions offered on the day of the event” – Gina Tleel, Executive Director of the South Lake Business Association. The South Lake Business Association gives special thanks to Corporate Center Pasadena, Logix Federal Credit Union, The Commons, Pasadena Star News, Pasadena Outlook, Pasadena Weekly and The Shops on Lake Avenue. Special thanks to businesses offering in-store promotions, festivities and/or prizes: Aaron Brothers, Alexandria II Bookstore, Arnold’s Fine Jewelry, Blind Color Nation, Bravo Salon Spa, Breakthru Fitness, Carnelian Salon, Celestino Ristorante & Bar, Coldwell Banker, Contessa Italian Foods, Corner Bakery Café, Craft Fair Gift Shop, Crystal Chalet, Culture Salon, Custom Comfort Mattress, Del Frisco’s Grille, Dunkin’, Du-par’s Restaurant & Bakery, DusitD2 Hotel Constance, Einstein Bros Bagels, European Wax Center, Fantastic Sams on Lake, Ferguson Bath, Kitchen & Lighting, Float, Floyd’s 99 Barbershop, Folia Collective, FrameStore, Great Destinations, Little Kuts Family Hair Salon, Logix Federal Credit Union, Nick’s South Lake Avenue, Nothing Bundt Cakes, One West Bank, Orvis Sporting Traditions, Paul Mitchell the School – Pasadena, Pet Food Express, Pie ‘n Burger, Pottery Barn Kids, Real Food Daily, Salad Farm, Salon Yuriy, Sanrio, SanSai Japanese Grill, Soul Cycle, Talbots, Ten Thousand Villages, The Bloke, The Counter, Urban Plates, Veggie Grill, Vitamin Shoppe, Which Wich Superior Sandwiches, Williams-Sonoma, Winchell’s, Woody’s Home, Yogurtland, and ZO Skin Centre. (Los Angeles, CA), Wednesday, November 8th, 2017: Come savor the finer things and be part of Masters of Taste 2018, L.A.’s premier outdoor, luxury food and beverage festival that will take place on Sunday, May 6th, 2018 from 3:00 pm to 7:00 pm on the field of the Historic Pasadena Rose Bowl! (Pasadena, CA), Monday, November 6th, 2017: The restaurant of tomorrow is here today: Introducing Twohey’s Tavern, from Greg Mallis and Tanya and Jim Christos, the three family members that keep the original Twohey’s name alive at the iconic 75-year-old Twohey’s Restaurant in Alhambra, which is a piece of Los Angeles history from the era of the Historic Route 66. With a tantalizing menu that playfully calls back to the classic All-American diner, Twohey’s Tavern officially opens its doors in Pasadena on Tuesday, November 7th, 2017! A lively new restaurant that pays tribute to the classic American diner, Twohey’s Tavern is no greasy spoon, but a cutting-edge hub of equally progressive and enduring flavors profiles. “The foodscape has changed dramatically,” explains Director of Operations Tom Anderson. “Chef Travis Limoge executes an elevated interpretation of nostalgic meals while honoring timeless and contemporary cooking techniques with a commitment to seasonality, bringing each guest a new experience in a modern tavern setting. Born and raised in Vermont, Chef Travis Limoge grew up in the kitchen of his Grandfathers beloved restaurants, most notably Valley’s Steakhouse, where port wine cheese and broasted chicken were all the rage and weekend brunches were a showcase for his Grandmothers baking prowess, laying the inspiring groundwork for a future Chef. After working summers in the kitchen while pursuing a career in professional snowboarding, which allowed Limoge to experience new cultures and flavors, Limoge decided to finally pursue cooking full-time. This decision led him to Los Angeles where he became Chef de Cuisine at Fork in the Road in Santa Monica and Mardi at Palihouse in West Hollywood. Chef LImoge then subsequently took a pilgrimage to Mexico after his grandmother’s passing, exploring the flavors of the different regions and the restaurants of Alejandro Ruiz, father to modern Mexican cooking. A serendipitous meeting with Chef Ruiz at the airport led to a further five months in Oaxaca learning all about countryside cooking, in both taste and technique. Upon his return to the states, Limoge came full circle with familiar roots at a family-owned restaurant in Twohey’s Tavern, where he seized the opportunity to marry his passion for modern composition and the warmth of his grandmother’s table. “The nostalgia is in the taste, but the cuisine is now,“ Limoge says of his culinary philosophy at Twohey’s Tavern. The new Twohey’s Tavern Dinner Menu reads just as the original 1943 Twohey’s Restaurant menu, its layout and terminology perhaps foreign to the modern-day foodie, but no less quaint, beginning with the original Twohey’s signature staple, the Burgers. Each burger features a robust patty made of a special custom Premium Angus Beef Blend, and no burger epitomizes the Twohey’s name at Twohey’s Tavern better than the Stinko 2.0, a grand incarnation on the legendary cornerstone Twohey’s burger, made with caramelized onions, house pickles, and garlic aioli. No need to pack your luggage to go Dutch Style, featuring Napa cabbage coleslaw, and dill aioli, or stick to the true red, white, and blue of the Americana, with American cheese, butter lettuce, onion, and ketchup. The Chili Dip, what we would now refer to as a chili burger, is comprised of house chili, Grafton cheddar, onion sprouts, and crème fraiche, and all burgers would be incomplete without their requisite accompaniment of House Fries. The real meat and potatoes rests with the Dinners at Twohey’s Tavern where Chef Limoge’s talent is front and center, turning everything his guests think they know about American diner food on its head, like with the Prime Eight Ounce Spencer Steak, prepared with roasted turnips, crème fraiche, fresh horseradish, and orange. The pig de résistance is undoubtedly the Ham Steak, which begins with a bone-in ham leg that brines for fifteen days, and is subsequently smoked for ten hours before getting plated and dressed up with summer peach preserves, sprouting broccoli, buckwheat honey, and charred orange. This next dish may be an oldie but goodie, but this isn’t your Meemaw’s Beef Stew, which features short-rib, fennel, onion, burnt carrot, rye toast, and whole grain mustard. The Fried Chicken utilizes a half chicken without the bones and is accompanied by braised greens, cranberry beans, and Bill’s Bees wildflower honey. Limoge also partners with Dock to Dish for his Seasonal Channel Island Rock Fish, all line-caught from Santa Barbara, with carrot mash, mole verde, and charred fennel. While the story behind the name Irish American Tortellini might be forever lost in time, there is no mystery about the flavor of this dish, comprised of crème fraiche stuffed tortellini, with house chili, cured egg yolk, and onion sprouts. Limoge also pays homage to his love of vegetables with the Roasted Roots, a vegan dish comprised of seasonal roasted root vegetables, green farro and celeriac purée. They may be called Sides, but these shareable bites can also double as starters, like the Port Wine Cheese, Chef Limoge’s tribute to his grandfather’s signature appetizer, or for something golden and crispy, there is no topping the beloved Twohey’s classic, the French Fried Onion Rings. Nothing is as deliciously retro as a Liver & Onions, and the reimagined Shrimp Cocktail, with pickled shrimp, house made coctel sauce, orange zest, and onion sprouts. For munchy carbs, nothing quite satisfies cravings like the House Fries, except for the House Pickles when one needs some crunchy tang. Lastly, the ultimate companion to the classic dining experience includes Creton, a pork based spread popularized in Quebec and New England, where Limoge keeps this paté-like starter fairly-traditional, but adds a unique spice blend. Add a touch of green to dinner with an array of Salads such as the Wedge, comprised of Tonnato vin, lardon, red onion, blue cheese, hard egg, tarragon, and tomato vinaigrette, to the elevated Dinner Salad, with a foundation of Market greens, tossed with red onion, croutons, Grafton cheddar, and ranch. The Boston Bibb Salad is sure to win over guests, with fresh orange, almonds, scallions, sweet onion, soft herbs, and an orange vinaigrette. Crunchy, sweet, and tangy, the Coleslaw is on another level, featuring fennel, persimmon, Napa cabbage, red onion, goat cheese, candied almonds, and cider vin, while the Potato Salad is beyond picnic perfection, comprised of roast fingerlings, horseradish, orange, crème fraiche, whole grain mustard, sage, and cured egg yolk. Twohey’s Tavern raises the candy bar with their sweet spin on their Desserts selections, with treats like the Citrus Pound Cake, made with peach preserves and homemade lavender ice cream, and the time-honored confectionery Jelly Roll, with seasonal preserves and Chantilly cream. The Caramel Chocolate Tart offers the ultimate indulgence, with a housemde almond crust, chocolate ganache, and caramel sauce, while guests will go bananas for the upscale Banana Split, featuring homemade banana ice cream, banana brûlée, Twohey’s bittersweet fudge, candied almonds, and whipped cream. Guests desiring an adventure in flavor will also enjoy the Seasonal Sundae, with house-made ice cream and seasonal toppings, while the Classic Sundae is for guests seeking the familiar, featuring the Original Twohey’s Bittersweet Fudge topping with whipped cream, roasted almonds and a cherry. Looking for a slice of nirvana to savor? Fear not, as Seasonal Pies will rotate on the menu all throughout the year. Chef Limoge also reimagines the quintessential Fountain Drinks with familiar yet innovative flavor profiles, beginning with the peachy keen Peach Shake, comprised of peach preserves, brown butter, sage ice cream, and whipped cream, and the sweet and savory Malted Maple Bacon Shake, featuring bacon ice cream, malt powder, Vermont maple syrup, and whipped cream. Is that one straw or two for your Strawberry Shake, made with basil ice cream, fresh strawberries, balsamic, and whipped cream. Traditionalists will not miss out with choices like the Root Beer Float, featuring Twohey’s root beer and choice of ice cream, and the chocoholic fantasy of Chocolate Soda, is made with chocolate syrup generously drizzled over vanilla ice cream, soda water, and chocolate whipped cream, and the Chocolate Shake, comprised of chocolate ice cream, Twohey’s Bittersweet Fudge, and whipped cream. Cocktail Consultant Patrick Tang is keeping things shaking and stirring for the Cocktail Menu. As the opening Bar Director at Otium in Downtown Los Angeles, Tang received first-rate tutelage from Julian Cox and Joshua Goldman. Today, Tang is mixing and pouring behind the bar at The Rose Cafe in Venice and he has also stepped behind the stick at Twohey’s Tavern to create a playful and delicious new cocktail list. “For Twohey’s Tavern, I have created fun and approachable cocktails while tipping my hat at Pasadena itself.” The Crown City cocktails begin with the Old Town, comprised of rye, Averna amaro, Lustau Vermut, and bitters, and continues with Tang’s personal favorite, the Rose Bowl, featuring pisco, gin, rosé syrup, strawberry, egg whites, citrus, and peach bitters. “The Rose Bowl is a nice play on a pisco sour that has complimentary notes between the rose and strawberry.” The Twohey’s Old Fashioned, pays tribute to the OG Twohey’s with bourbon, Twohey’s Root Beer, and chocolate mole bitters. Time to howl at the moon over a smoky campfire with Into the Wild, featuring mezcal, blueberry-thyme shrub, and lime, or enjoy the spicy piquancy of El Pomelo, made with tequila, Aperol, ancho chile, grapefruit oleo saccharum, lime, and soda water. Just in time for the fall harvest is Bobbing For Apples, comprised of bourbon, Honeycrisp apple, cinnamon syrup, apple gomme, lemon, and sparkling wine, while beer lovers can enjoy the best of both worlds with the Vixen, featuring vodka, IPA reduction, cucumber, Hawaiian black sea salt, and lime. “This cocktail retains that earthy hoppy flavor,” says Tang. Rounding off the cocktail menu is a cocktail that will have you feeling like A Million Bucks, beginning with guest’s choice of spirit, ginger, lime, and soda water. Combining the nostalgic flavors of the past with the elevated flavors of today is what makes Twohey’s Tavern the most exciting new addition to Pasadena! Twohey’s Tavern is open for Dinner every Sunday through Thursday from 5:00 pm to 10:00 pm and the Bar is open from 5:00 pm to 11:00 pm. Twohey’s Tavern is open for Dinner every Friday and Saturday from 5:00 pm to 11:00 pm and the Bar is open from 5:00 pm to 12:00 Midnight. For more information or reservations, please visit www.TwoheysTavern.com or call Twohey’s Tavern directly at 626.449.2337. The 40th Occasional Pasadena Doo Dah Parade will be held on Sunday, November 19th, stepping off at 11:00 a.m. on the streets of East Pasadena. To enter the parade simply go to the website and get the entry form. Call for more information on How to Enter at (626) 590-1134. Public Information Number: (626) 590-7596. The Occasional Pasadena Doo Dah Parade will celebrate 40 years of irreverent frolicking on the streets of Pasadena. Join us by getting your FREE general audience tickets here or SIGN UP to be a marcher in the parade! The 2017 Parade takes place on Sunday, November 19th, stepping off at 11am in East Pasadena along Colorado Boulevard, the original Route 66. Entries are open to everyone. This year’s lineups includes the Nut Camp, Bildge Rat, Code Blue DeFibs, The Addams Family, Flying Baby Homerun Border Crossing, Nordic Men, Radioactive Chickenheads, Toaster Car, Motorized Furniture, The Army of Toy Soldiers, Tortilla Target, The Billionaires, Free Thought Society, Unich Band, Car-Pool DeVille, Bearded Ladies, Yiddish Dracula, Drunk in the Garage Band, Partying Parrotheads, Murrugun the Mystic, Crimebo the Clown, Man as Giraffe, Heuristicus, The Butler, Recumbent Revolution, Circuit Benders, Zucchini Patrol, and Doo Dah’s 2017 Royals, among many others. Secret Santa, Doo Dah’s take on the North Pole icon, will close the conga line and ring in the holiday season. And… not a rose will be harmed in the making of this parade! Entry Forms and further information to be found on the website: www.pasadenadoodahparade.info or visit www.facebook.com/PasadenaDooDahParade. The Pasadena Doo Dah Parade is owned and produced by Light Bringer Project, a nonprofit arts organization based in Pasadena. 2017 Doo Dah Shirts Are Here! Available for Pre-Parade Purchase at our organization’s ONLINE STORE HERE. Shirts are $20 each while supplies last! The 2017 Pasadena Doo Dah Parade Queen is Imani Phoenix!